Smashing our fundraising goals…one Salty Macadamia Pearl at a time! We are thrilled to announce the astonishing outcome of our Salty Macadamia Pearl fundraiser… If you haven’t heard yet, we partnered with the Women’s & Children’s Hospital Foundation (WCH Foundation) last year, with the intention of raising $8,000 for their Beach House Project. With your help, we were able to raise an amazing $10,000.85! We would not have been able to surpass our goal without your help; so a huge thank you to each and every one of you who supported us by buying a bag of our Salty Macadamia Pearls. The Foundation’s goal was to raise $2.5 million for a purpose-built, medically equipped and fully furnished beach house as Encounter lakes in Victor Harbor, SA and we are humbled to be able to contribute to this cause. This holiday house will be a special place for children with life-limiting or long-term chronic illness, and their families to enjoy and make memories that will last a lifetime. If you would like to read more about the project and view updates of the Beach House, please visit the WCH Foundation Website. 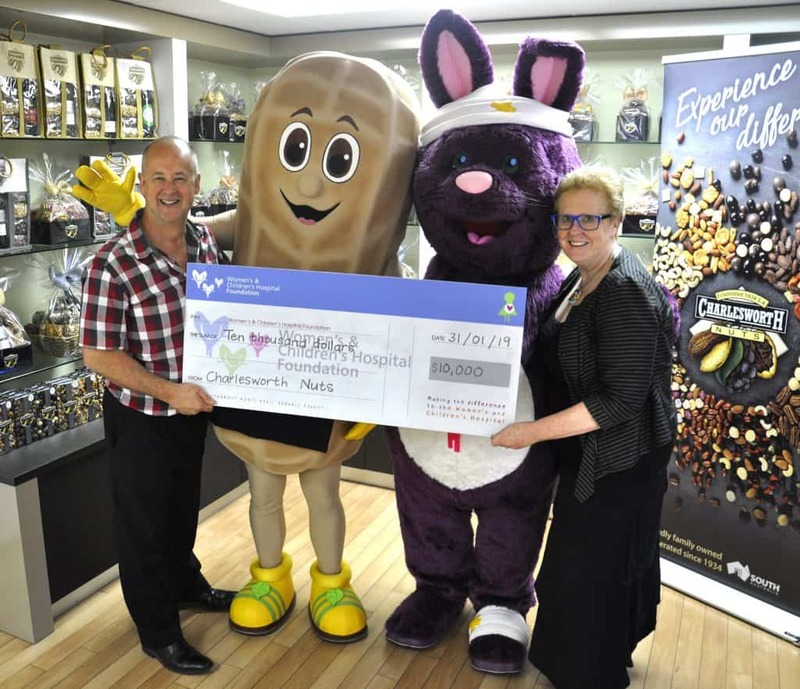 Below you can see the fabulous TK Bunny and Charley Peanut, together with Charlesworth Nuts CEO, Brett Charlesworth and WCH Foundation CEO, Jane Scotcher. This entry was posted in Charlesworth Nuts, News. Bookmark the permalink.